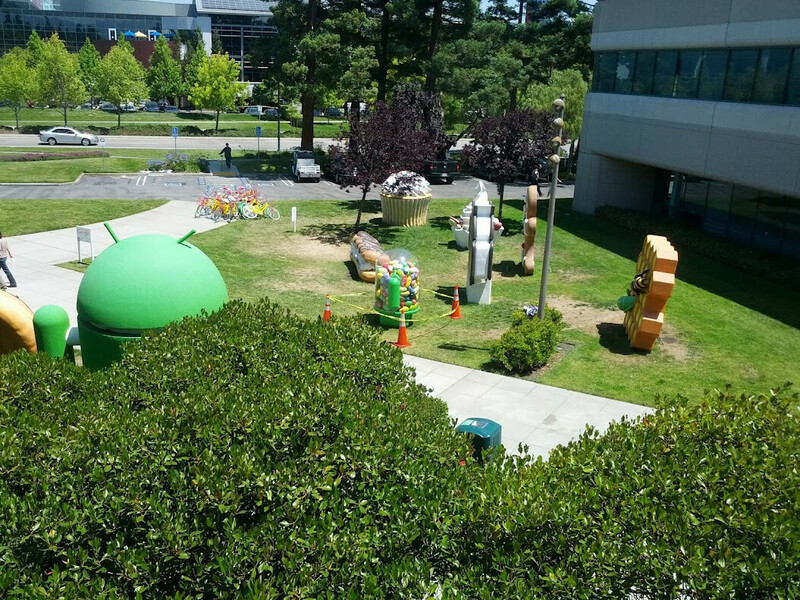 Google has the habit of putting life-size mascots on its lawn each time a new Android version is born, with the name of treats every sweet tooth worldwide is in love with. 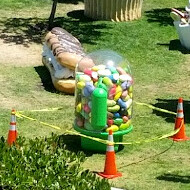 The latest Android 4.1 Jelly Bean version saw its mascot - a green robot with a belly full of pseudo-candy - being erected on the grass around Google's headquarters not long before the version was announced for the masses at the I/O conference last week. Due to the sweltering heat that has plagued the US for a while now, heads had rolled, and the mascot was left without its upper part, not to mention that someone went in and stole one of the candies inside. Google's team is apparently hard at work fixing the damage from global warming, and has coned off the statue in the meantime. Maybe time for them to let us taste it then. . .
You wished! Will happen only in your wildest dreams, don't worry..
no, jelly bean is too hot a topic right now the statue can't help being hot as well.. accept the fact.. Global warming? Hah. A flying spaghetti monster would be more likely to exist. Thumbs down? Okay, sure. Global warming is just fluctuation in sunspot activity, nothing more. Temperature increases and decreases all the time because of it. Of course, there are other factors that determine temperature, but the sunspot activity is the reason for the quick changes. Why has the temperature on other planets increased the same percentage as Earth has in the last few years? Maybe it's from fuel emission in Martian cars. Of course it's not, but the AUTHOR needn't bring it up either. I think that is his point. Non_Sequitur, global warming is a natural phenomenon caused (among other things which are yet unknown) by the changes in earths orbit and axel. The changes cause earth's temperature to rise and fall (ice ages and "warm periods"). We are currently headed to a warm period and that is the reason for the rising temperatures. Now scientists believe that we have fastened the warming with green house gases like co2 and methane. The effects of the quickening are unknown. WP8, maybe. I feel it's way too late for any BB. Not even WP8, as it's still no match for JB. its not global warming, its SUMMER. If it was in Louisiana, it would have to be inside like everything else is...except Alligators and the school air-boats. guess the jelly beans inside for free nexus! come on google! Sweltering heat? It was raining non stop where I live. All around my house is still flooded (thankfully I live on a little hill). Haven't even been outside to see if it's hot because of so much water. We need that heat where I am, maybe it will dry up some of the water, it's too much my little country town can take. Why is it that when it gets hot in the summertime (first time ever btw) it's global warming. But if it gets cold in the wintertime, it's weather? Inquiring minds... etc. Wrong, when it doesn't suit the agenda it is "climate change". (IE, colder than I should be) But now that we are having an unusually warm summer it is "global warming" and we are all going to "die" from it. Just another call for "government regulation." It's time we see it for what it really is.